In a rare show of solidarity, the U.S., Germany, and France have all expressed unity in their position that the poisoning of Sergei Skripal and his daughter Yulia, involving a military-grade nerve agent, was ‘likely’ attributable to Russia. 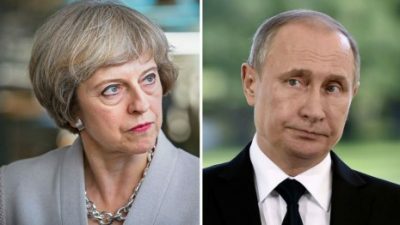 While the Russian government has denied responsibility, the government of Theresa May has responded to the incident by expelling 23 Russian diplomats, the largest such expulsion since the cold war. Yet, the UK PM jumped to conclusions about the incident with an alacrity worthy of an Olympic level athlete! With the Skripal poisoning saga continuing to dominate international headlines, this week’s Global Research News Hour attempts to probe the justification for and context of the West’s latest propaganda push against the world’s largest nation. In the first half hour, we hear from Moscow based journalist and author John Helmer about his take on the poisoning of former Russian double-agent Sergei Skripal, his evaluation of the available evidence pointing to a professional assassination attempt by Russia, his assessment of the political response to the incident, and his opinion of the significance of a recent Court ruling, published on his website, summarizing the blood sampling and other evidence in the case. In the second half hour, we continue to pursue the ‘Get Russia’ theme with a never before aired interview with Kees Van Der Pijl from October of 2017. Author of a recently released book on MH 17, Van Der Pijl is convinced that the official story of the downing of the flight is impossible. In this half hour conversation, he provides some of the geopolitical context of the incident and speaks to the unlikelihood of political or media breakthroughs regardless of the evidence. John Helmer is the longest continuously serving foreign correspondent in Russia, A former professor of political science, sociology and journalism and former staffer with the Carter Administration, Helmer is a frequent commenter on topics related to Russia. His site, ‘Dances with Bears’ can be found at johnhelmer.net. Kees Van Der Pijl is a Professor Emeritus of International Relations at the University of Sussex and former director of the Centre for Global Political economy. He is currently active with the Dutch anti-fascist resistance, having served as its president. In 2017 he authored the book, Flight MH17, Ukraine and the new Cold War. The Global Research News Hour airs every Friday at 1pm CT on CKUW 95.9FM in Winnipeg. The programme is also podcast at globalresearch.ca . Excerpts of the show have begun airing on Rabble Radio and appear as podcasts at rabble.ca. Burnaby Radio Station CJSF out of Simon Fraser University. 90.1FM to most of Greater Vancouver, from Langley to Point Grey and from the North Shore to the US Border. It is also available on 93.9 FM cable in the communities of SFU, Burnaby, New Westminister, Coquitlam, Port Coquitlam, Port Moody, Surrey and Delta, in British Columbia, Canada. – Tune in at its new time – Wednesdays at 4pm PT. Radio station CFUV 101.9FM based at the University of Victoria airs the Global Research News Hour every Sunday from 7 to 8am PT. CORTES COMMUNITY RADIO CKTZ 89.5 out of Manson’s Landing, B.C airs the show Tuesday mornings at 10am Pacific time. Cowichan Valley Community Radio CICV 98.7 FM serving the Cowichan Lake area of Vancouver Island, BC airs the program Thursdays at 6am pacific time. Campus and community radio CFMH 107.3fm in Saint John, N.B. airs the Global Research News Hour Fridays at 10am.